You are here: Home » Netflix comes to Ireland\UK but was it worth the wait? Netflix comes to Ireland\UK but was it worth the wait? 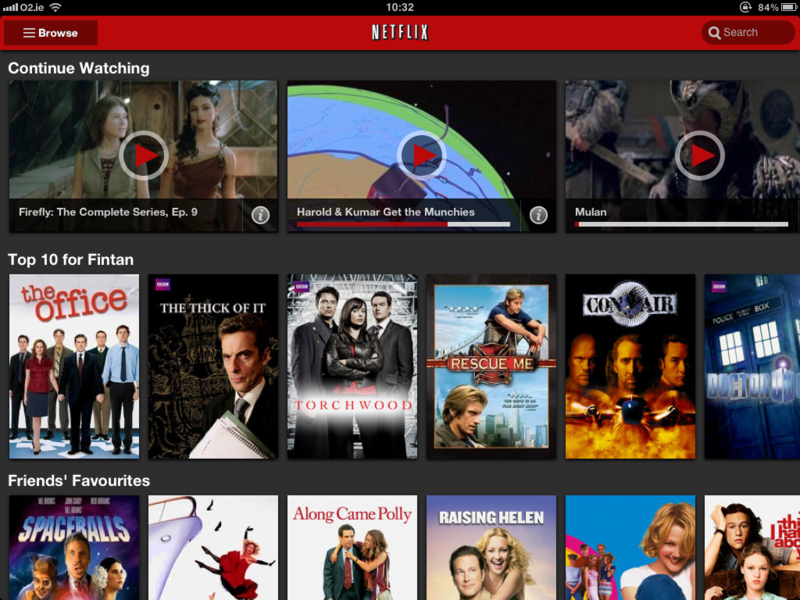 After a long wait the streaming service Netflix launched earlier in January in the UK and Ireland. I have been using Apple TV for movie rentals for the past year on a charge per item basis so the idea of streaming all my content for a set monthly fee was very appealing. €7 euro per month and watch as many movies or TV series as you want. As soon as it became available I was on the site to see what they offered and was very disappointed with the content. It seemed old and had a relatively small collection in the library with a very small number of recently released movies. I was left a little frustrated but I took advantage of the first month being free to try it out. However, though many items are a few years old I am thoroughly enjoying the service. I had a good browse at all that is available in their library and there were quite a number of movies or series I have wanted to see but as I am not much for scheduled TV I have never seemed to catch or bothered to rent or buy on DVD. Dexter, Firefly, The Inbetweeners, Wallander, Warehouse 13, Saturday Night Live, Hitchhiker’s Guide, Dune, The IT Crowd, and the list goes on. I can watch Netflix on the laptop, AppleTV, iPad or iPhone. While stuck in the car a few days after signing up I decided to give it a try across the 3G connection on the iPad. I watched 2 episodes of The IT Crowd in perfect quality. And that generally has been my experience, whether it’s the kids popping on a movie or me grabbing an episode of Firefly or The IT Crowd it is just great. No matter what I access my account from it remembers exactly where I stopped watching which is great. I start watching on the iPad and a couple of days later I can turn on the AppleTV and continue from exactly where I left off. A good broadband connection for home is needed and it will impact your download allowance if you are limited. Other than that if you like TV on demand from any of your devices then this set fee per month is well worth a look. For now they have a customer in me and I will recommend it to others as I do believe its good value for money. I hope that as the weeks and months go by they update the content so I can stay a customer. Never having to purchase or rent a DVD, box set, or other medium is hugely appealing for many reasons. Just select what we want from a list and watch it, whenever, wherever and on whatever device we want. ← The future of mobile and what it might mean for us.